We are proud to present this stunning 2013 Bentley Continental GTC finished in Beluga Black with a Black Leather Interior & Contrasting White Stitching! This car has a great specification including Fully Electric Adjustable Heated Leather Seats with Memory Functions, Leather Multi-Function Steering Wheel, Digital Trip Computer, Cruise Control, Keyless Push Button Start, Electric Parking Brake, Electric Folding & Heated Mirrors, Dynamic Driving Modes, Adjustable Suspension Dampers, Dual Climate Control, Air Conditioning, DAB Radio, Bluetooth Smart Phone Connectivity, Full Colour Satellite Navigation, On-board Tyre Pressure Sensors, Front & Rear Parking Sensors, Breitling Dashboard Clock and Bentley Logo Stitched Headrests. 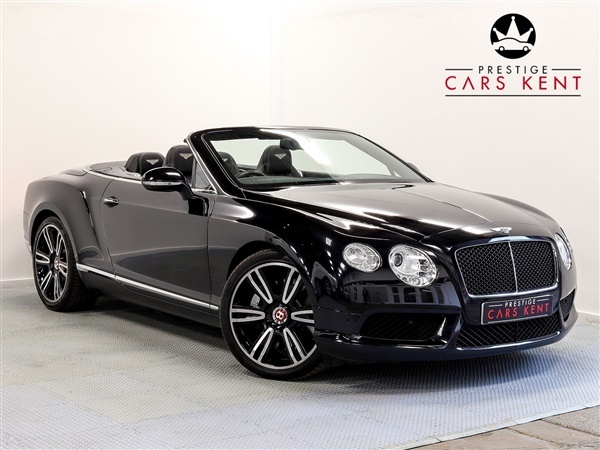 To discuss this excellent car further please contact a member of our Sales Team on the number listed above.,We are proud to present this stunning 2013 Bentley Continental GTC finished in Beluga Black with a Black Leather Interior & Contrasting White Stitching! This car has a great specification including Fully Electric Adjustable Heated Leather Seats with Memory Functions, Leather Multi-Function Steering Wheel, Digital Trip Computer, Cruise Control, Keyless Push Button Start, Electric Parking Brake, Electric Folding & Heated Mirrors, Dynamic Driving Modes, Adjustable Suspension Dampers, Dual Climate Control, Air Conditioning, DAB Radio, Bluetooth Smart Phone Connectivity, Full Colour Satellite Navigation, On-board Tyre Pressure Sensors, Front & Rear Parking Sensors, Breitling Dashboard Clock and Bentley Logo Stitched Headrests. To discuss this excellent car further please contact a member of our Sales Team on the number listed above. This advert is for a Bentley Continental, click Bentley Continental in Orpington to see more cars like this in the local area. Want to search further afield? Click Bentley Continental in Kent to search for similar cars in the wider Kent area.